This native American black caviar is harvested from American Bowfin a bony fish from southern US backwaters. It doesn't belong to the Sturgeon family though Bowfish is more ancient. Due to its areal the Bowfish Caviar is widely used in the original Cajun cuisine and is well known as Choupique caviar. The grains are small in size and pearly of brownish to jet-black color with glossy and firm egg shell. The Bowfin Black Caviar is getting more trendy for its distinctive mildly tangy flavor. As it is similar in size and appearance to Sturgeon Caviar it can be used as its affordable substitute especially for the cooked dishes. It is normally used by chefs to cater large parties and events. However, Bowfin Caviar should only be served cold and is not suitable for cooking or garnishing hot dishes. Please pay attention that it changes color to red when heated! Note: Bowfin is not related to the sturgeon family, therefore it does not need a CITES permit for export. - Flavor: Mildly tangy flavor - Manufacturer: Marky's - Brand: Marky's Caviar - Origin: USA - Size: Small pearly grains - Color: Dark chestnut brown to black in color - Shipping: Product is perishable and will be shipped via Overnight delivery - Storage Type: Only Refrigerated, 32 - 38F - Appearance: Glossy - Best served with cr?me fraiche and a blini or lemon wedges - Drinks: Ice cold vodka or dry white wine. - We guarantee you won't be disappointed with delicious flavor of our caviar! Delectably fresh and exceedingly aromatic, Marcy?s American Black caviar ranges in color from dark chestnut brown to black, its firm grain is pleasing and juicy, with a distinctive mildly tangy flavor that inspires fierce loyalties. This caviar is the best when enjoyed with ice cold vodka or dry white wine. Note: limited quantities. 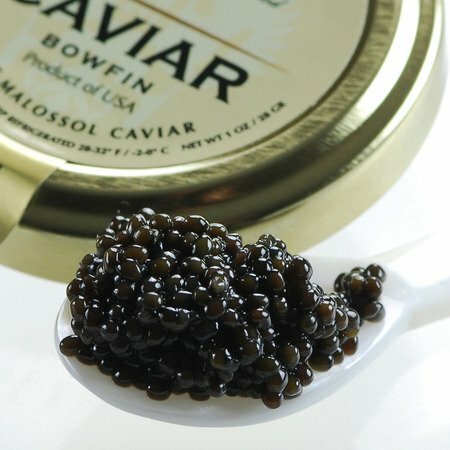 We offer a unique and unsurpassed selection of the finest, first quality malossol caviar available, directly sourced and hand selected from each harvest. High quality at a low price! If you have any questions about this product by Marky's Caviar, contact us by completing and submitting the form below. If you are looking for a specif part number, please include it with your message. Seamazz Peeled and deveined Tail On Raw Shrimp, 2 Pound -- 10 per case.